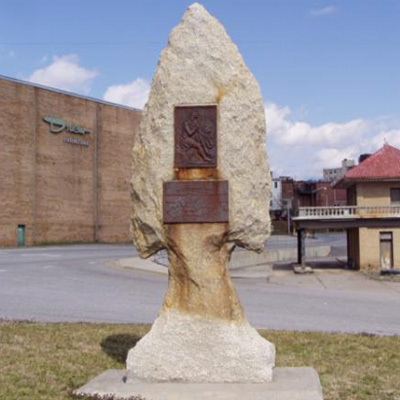 This Boone Highway marker consists of a large arrowhead and shaft carved from a single piece of stone. It stands roughly 12-feet tall and holds two tablets on each side. The upper tablets are Style-3 Boone Highway which were primarily used between 1927 and 1938 and are distinguished by the BOONE TRAIL HIGHWAY caption being slightly curved. They have an image in relief taken from Alonzo Chapel’s 1861 illustration of Daniel Boone and his hunting dog. The lower tablets are metal maps that accompany some Boone Highway tablets and mention specific locations on the Boone Trail Highway. The map shows the road’s route through Virginia, North Carolina, Tennessee and Kentucky and also has a copy of Daniel Boone’s signature found on court documents in Salisbury. This Boone Highway marker was numbered 8B by Everett G. Marshall. His interest and research of the markers led to the book, Rich Man: Daniel Boone. The numbering system was simply the order in which he found or became aware of a marker. The marker is located at the intersection of Wilkesboro Blvd. and Independent Avenue in North Wilksboro, NC. The Boone Trail Highway Marker #8A is several blocks away. The memorial marker stands in a small grassy area that borders the parking lot of a nearby restaurant. The marker was temporarily removed in 1998 for a highway widening project. When replaced in 2000 it was moved to a location directly across Independent Avenue from where it originally stood.